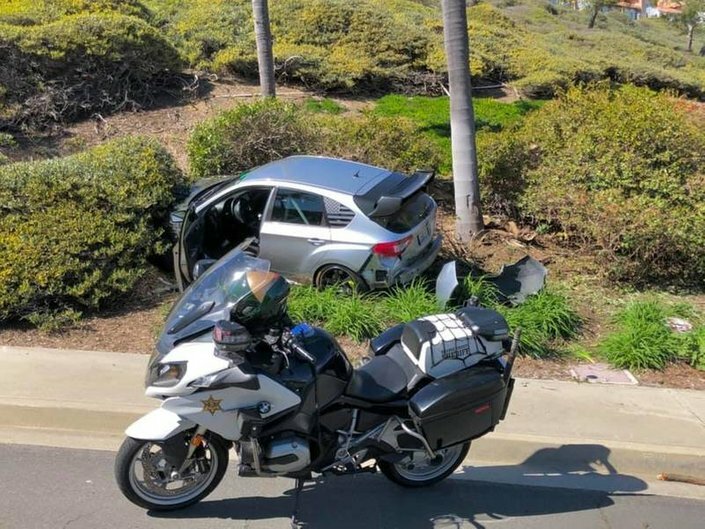 LAGUNA NIGUEL, CA — Patch readers contacted us about a commotion in the Niguel Road and Highlands Avenue area of Laguna Niguel. Here is our report. On Friday, at approximately 12:30 p.m., Orange County Sheriff's Department motor deputies attempted to pull over "a vehicle with a loud exhaust," they told us. When the driver of the silver Subaru WRX sedan, with spoiler and oversized exhaust, "decided not to pull over and fled," OCSD deputies began pursuit with lights and sirens. The brief pursuit ended when the vehicle crashed into a street sign, coming to rest on Niguel Road just passed Via Napoli. "The driver is going to jail for felony evading," the Watch Commander said. All show and no go, I guess.